One of the programs people here at CIRM love is our Bridges to Stem Cell Research Awards. These are given to undergraduate and master’s level college students, to train the next generation of stem cell scientists. How good a program is it? It’s terrific. You don’t have to take my word for it. Just read this piece by a great stem cell champion, Don Reed. Don is the author of two books about CIRM, Stem Cell Battles and California Cures! so he clearly knows what he’s talking about. Imagine yourself as a California college student, hoping to become a stem cell researcher. Like almost all students you are in need of financial help, and so (let’s say) you asked your college counselor if there were any scholarships available. If you were accepted, how might your life change? After doing some basic training at the college, you would receive a grant (roughly $40,000) for a one-year internship at a world-renowned stem cell research facility. What an incredible leap forward in your career, hands-on experience (essentially a first job, great “experience” for the resume) as well an expert education. Let’s take a look at one of these college programs in action: find out what happened to a few of the students who received a Bridges award, crossing the gap between studying stem cell research and actually applying it. HSU information is courtesy of Dr. Amy Sprowles, Associate Professor of Biological Sciences and Co-Director of the Bridges program at Humboldt State University (HSU), 279 miles north of San Francisco. “The HSU Bridges program”, says Dr. Sprowles, “was largely developed by four people: Rollin Richmond, then HSU President, who worked closely with Susan Baxter, Executive Director of the CSU Program for Education and Research in Biotechnology, to secure the CIRM Bridges initiative; HSU Professor of Biological Sciences Jacob Varkey, who pioneered HSU’s undergraduate biomedical education program”, and Sprowles herself, at the time a lecturer with a PhD in Biochemistry. The program has two parts: a beginning course in stem cell research, and a twelve-month internship in a premiere stem cell research laboratory. For HSU, these are at Stanford University, UC Davis, UCSF, or the Scripps Research Institute. Like all CIRM Bridges programs, the HSU stem cell program is individually designed to suit the needs of its community. Each of the 15 CIRM Bridges Programs fund up to ten paid internships, but the curriculum and specific activities of each are designed by their campus directors. The HSU program prepares Bridges candidates by requiring participation in a semester-long lecture and stem cell biology laboratory course before selection for the program: a course designed and taught by Sprowles since its inception. She states, “The HSU pre-internship course ensures our students are trained in fundamental scientific concepts, laboratory skills and professional behaviors before entering their host laboratory. We find this necessary since, unlike the other Bridges campuses, we are 300+ miles away from the internship sites and are unable to fully support this kind of training during the experience. It also provides additional insights about the work ethic and mentoring needs of the individuals we select that are helpful in placing and supporting our program participants”. Ten years after it began, 76 HSU students have completed the CIRM Bridges program at HSU. Of those, the overwhelming majority (over 85%) are committed to careers in regenerative medicine: either working in the field already, or continuing their education toward that goal. SAMANTHA SHELTON: “CIRM Bridges provided invaluable hands-on training in cell culture and stem cell techniques that have shaped my future in science. My CIRM internship in John Rubenstein’s Lab of Neural Development taught me amazing laboratory techniques such as stem cell transplantation as well as what goes into creating a harmonious and productive laboratory environment. My internship projects led to my first co-first author publication. Like warriors fighting to save lives, these young scientists are engaged in an effort to study and defeat chronic disease. It is to be hoped the California stem cell program will have its funding renewed, so the “Bridges” program can continue. April 11th is World Parkinson’s Disease Awareness Day. To mark the occasion, we’re featuring the work of CIRM-funded researchers who are pursuing new, promising ideas to treat patients with this debilitating neurodegenerative disease. Research: Birgitt and her team at the Parkinson’s Institute in Sunnyvale, California, are using CRISPR gene editing technology to reduce the levels of a toxic protein called alpha synuclein, which builds up in the dopaminergic brain cells affected by Parkinson’s disease. Research: Jeanne Loring and her team at the Scripps Research Institute in La Jolla, California, are deriving dopaminergic neurons from the iPSCs of Parkinson’s patients. Their goal is to develop a personalized, stem cell-based therapy for PD. Justin Cooper-White, Scaled BioLabs Inc.
Research: Justin Cooper-White and his team at Scaled Biolabs in San Francisco are developing a tool that will make clinical-grade dopaminergic neurons from the iPSCs of PD patients in a rapid and cost-effective manner. High throughput differentiation of dopaminergic neuron progenitors in microbioreactor chambers in Scaled Biolabs’ cell optimization platform. Different chambers receive different differentiation factors, so that optimal treatments for conversion to dual-positive cells can be determined (blue: nuclei, red: FOXA2, green: LMX1A). Research: Xinnan Wang and her team at Stanford University are studying the role of mitochondrial dysfunction in the brain cells affected in Parkinson’s disease. Could the Answer to Treating Parkinson’s Disease Come From Within the Brain? Oh well, it’s going to be another year of disappointment for me. Not only did I fail to get any Nobel Prize (I figured my blogs might give me a shot at Literature after they gave it to Bob Dylan last year), but I didn’t get a MacArthur Genius Award. Now I find out I haven’t even made the short list for the Stem Cell Person of the Year. Paul invites people to nominate worthy individuals – this year there are 20 nominees – people vote on which one of the nominees they think should win, and then Paul makes the final decision. Well, it is his blog and he is putting up the $2,000 prize money himself. Whoever wins will be following in some big footsteps including patient advocates Ted Harada and Roman Reed, as well as scientists like Jeanne Loring, Masayo Takahashi, and Elena Cattaneo. So vote early, vote often. Stem cell transplants help put MS in remission: A combination of high dose immunosuppressive therapy and transplant of a person’s own blood stem cells seems to be a powerful tool in helping people with relapsing-remitting multiple sclerosis (RRMS) go into sustained remission. Multiple sclerosis (MS) is an autoimmune disorder where the body’s own immune system attacks the brain and spinal cord, causing a wide variety of symptoms including overwhelming fatigue, blurred vision and mobility problems. RRMS is the most common form of MS, affecting up to 85 percent of people, and is characterized by attacks followed by periods of remission. The HALT-MS trial, which was sponsored by the National Institute of Allergy and Infectious Diseases (NIAID), took the patient’s own blood stem cells, gave the individual chemotherapy to deplete their immune system, then returned the blood stem cells to the patient. The stem cells created a new blood supply and seemed to help repair the immune system. Five years after the treatment, most of the patients were still in remission, despite not taking any medications for MS. Some people even recovered some mobility or other capabilities that they had lost due to the disease. Using stem cells to model brain development disorders. 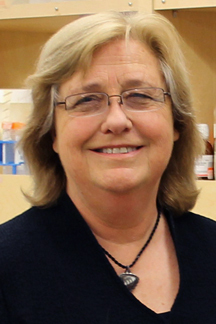 (Karen Ring) CIRM-funded scientists from the Scripps Research Institute are interested in understanding how the brain develops and what goes wrong to cause intellectual disabilities like Fragile X syndrome, a genetic disease that is a common cause of autism spectrum disorder. Because studying developmental disorders in humans is very difficult, the Scripps team turned to stem cell models for answers. This week, in the journal Brain, they published a breakthrough in our understanding of the early stages of brain development. They took induced pluripotent stem cells (iPSCs), made from cells from Fragile X syndrome patients, and turned these cells into brain cells called neurons in a cell culture dish. They noticed an obvious difference between Fragile X patient iPSCs and healthy iPSCs: the patient stem cells took longer to develop into neurons, a result that suggests a similar delay in fetal brain development. The neurons from Fragile X patients also had difficulty forming synaptic connections, which are bridges that allow for information to pass from one neuron to another. A Day to Discover What Stem Cells Are All about. (Karen Ring) Everyone is familiar with the word stem cells, but do they really know what these cells are and what they are capable of? Scientists are finding creative ways to educate the public and students about the power of stem cells and stem cell research. A great example is the University of Southern California (USC), which is hosting a Stem Cell Day of Discovery to educate middle and high school students and their families about stem cell research. The event is this Saturday at the USC Health Sciences Campus and will feature science talks, lab tours, hands-on experiments, stem cell lab video games, and a resource fair. It’s a wonderful opportunity for families to engage in science and also to expose young students to science in a fun and engaging way. Interest in Stem Cell Day has been so high that the event has already sold out. But don’t worry, there will be another stem cell day next year. And for those of you who don’t live in Southern California, mark your calendars for the 2017 Stem Cell Awareness Day on Wednesday, October 11th. There will be stem cell education events all over California and in other parts of the country during that week in honor of this important day. It’s the year 2286. The transmission signal of an alien space probe is wreaking havoc on Earth, knocking out the worldwide power grid and causing massive storms. It turns out the mysterious orbiting probe is trying to communicate with humpback whales through whale song and the devastation won’t stop until contact is made. But there’s a tiny problem: in that future, the humpback has long since become extinct. So the captain and crew travel back in time to snag two whales and save 23rd century civilization. Phew! My fellow science fiction nerds will recognize that plot line from 1986’s Star Trek IV: A Voyage Home. It’s pure fantasy and yet there is a real lesson for our present day world: you shouldn’t underestimate how the extinction of a species will impact our world. For instance, the collapse and potential extinction of the bee population and other pollinators threatens to destabilize our global food supply. Beyond how it may affect us humans, I think there’s also a moral obligation to save endangered species that have dwindled in number directly due to human actions. It may be too late for the northern white rhino though. Because their horns are highly sought after as a status symbol and for use in traditional medicine, poachers have wiped out the population and now only three – Sudan, Najin and Fatu (grandfather, mother and daughter) – exist in the world. Sadly, none of them can breed naturally so they quietly graze in a Kenyan conservation park as their species heads towards extinction. Jeanne Loring, a CIRM grantee and professor at The Scripps Research Institute, still sees a glimmer of hope in the form of stem cells. In an essay published yesterday in Genetic Engineering and Biotechnology News, Loring describes her research team’s efforts to apply stem cell technology toward saving the Northern White Rhino and other endangered species. Their efforts began about ten years ago in 2007, the same year that Shinya Yamanaka’s lab first reported that human fibroblasts, collected from a skin sample, can be reprogrammed into an embryonic stem cell-like state with the capacity to indefinitely make copies of themselves and to specialize into almost every cell type of the body. The properties of these induced pluripotent stem (iPS) cells have provided an important means for studying all sorts of human diseases in a lab dish and for deriving potential cell therapies. FrozenZoo® and iPS Cells: A Modern Day Noah’s Ark? “It was obvious to us: why not try to reprogram fibroblasts from the FrozenZoo®? When my group returned to the lab from the safari, I asked them: who would like to try to reprogram fibroblasts from an endangered species? It was far from a safe bet, but a young postdoctoral researcher who had recently joined my lab from Israel said that she’d love to give it a try. Inbar Friedrich Ben-Nun spent the next couple of years trying out methods in parallel on human cells and fibroblasts from the zoo. We chose fibroblasts from the drill because it is [an endangered] primate, making it more likely that the technology used for humans would work. So how exactly would these iPS cells be used to save the northern white rhino and other animals from the brink of extinction? Last December, Ben-Nun along with 20 other scientists and zoologists from four continents met in Vienna to map out a strategy. They published their plan on May 3rd in Zoo Biology. In the first phase, an in vitro fertilization (IVF) procedure for the rhino – never before attempted – will be worked out. Frozen sperm samples from four now-deceased rhinos plus one sample from Sudan are ready for IVF. Researchers then hope to collect eggs from Najin and Fatu and implant embryos in surrogates of a related species, the southern white rhino. However, even if IVF is successful, the offspring would not represent enough genetic diversity to ultimately thrive as a species in the wild. So in the second phase, iPS cells will be generated using tissue fibroblast samples from several more northern whites that were banked in The FrozenZoo®. Those iPS cells will be specialized into sperm and eggs to provide a larger, more diverse set of embryos which again will be implanted in surrogate rhinos. Breeding animals using iPS-derived sperm and eggs has only been successful in mice so much work remains. Knight’s point is well-taken that conventional conservation approaches are critical to ensure that the southern white rhino doesn’t meet the same disastrous fate as the northern white. But if the funding is available, it seems worth the effort to also attempt this innovative iPS strategy, a technology that’s deep in development now and not awaiting Captain Kirk’s distant Star Trek future. A step forward for Parkinson’s disease? Imagine how frustrating it would be to not know whether you could physically sit through a dinner with friends or to worry about getting stuck in the grocery isle, fighting against a body that refuses to move. These nightmare-like experiences are what many Parkinson’s disease (PD) patients deal with on a daily basis. PD affects approximately one million people in the US, and there is no prevention or cure. While substantial funding efforts are being dedicated to PD research (CIRM, Michael J. Fox Foundation, Parkinson’s Disease Foundation, to name a few), a cure is still years or maybe even decades away. However, a new stem cell therapy from Australia has the potential to make waves in what’s been a relatively flat sea of PD stem cell therapies that haven’t yet secured the funding or jumped the regulatory hurdles to make it into clinical trials. Biotech journalist Bradley Fikes broke the story yesterday in the San Diego Union Tribune. Fikes is one of my favorite science writers so instead of attempting to re-write an already eloquent piece, I’ll just mention a few highlights. The Australian government approved the use of ISCO’s parthenogenic stem cell therapy in twelve PD patients in a clinical trial that is slated to start in the first quarter of 2016 (pending final approval from the Royal Melbourne Hospital review board). This therapy uses brain stem cells derived from pluripotent stem cells obtained from unfertilized human eggs, thus avoiding the ethical issues attached to use of embryonic stem cells. (For sciency details check out the ISCO website). The goal of the trial will be to determine if ISCO’s stem cell therapy is safe and also effective at reducing PD symptoms like tremors and stunted movement. Fikes explained that ISCO chose Australia for it’s proposed clinical trial for regulatory reasons. 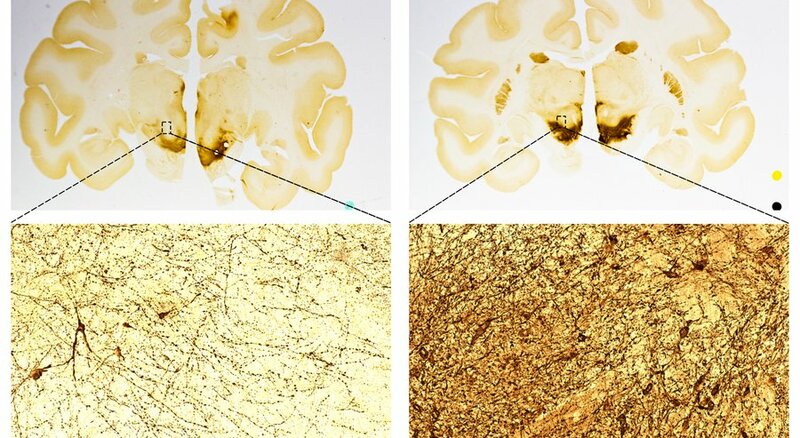 A comparison of primate brains to show an increase in the number of neurons after treatment with ISCO’s stem cells. The left side is a control sample. The right side is from a treated brain. — International Stem Cell Corp.
ISCO’s is only one of a handful of groups proposing stem cell therapies for PD. Fikes mentioned other therapies currently being tested that are derived from embryonic stem cells, induced pluripotent stem cells (iPSCs), and adult stem cells like the mesenchymal and fat stem cells. He also highlighted important ongoing research by CIRM grantee Dr. Jeanne Loring from the Scripps Research Institute. Loring founded the Summit for Stem Cell organization that’s generating iPSCs from PD patients with hopes of treating these patients with a dose of their own brain stem cells. In the last few years some 24 states have approved so-called “Right to Try” laws. These are intended to give terminally ill patients faster and easier access to experimental therapies. But a panel of experts at the World Stem Cell Summit in Atlanta today said they are more symbolic than anything and do little to actually help patients get much-needed therapies. The Right to Try laws are modeled after a federal law that allows “compassionate use” of experimental medications and lets doctors prescribe investigational medicines being safely used in early stage clinical trials. Aaron Levine from Georgia Tech says it’s also misleading to assume that just because a state passes a Right to Try law that it has any legal impact. He says state laws don’t over rule the Food and Drug Administration’s (FDA) regulation of this area and so the federal government would still have the authority to stop this kind of access. But Levine says these laws are interesting in that they are indicative of the growing determination of patients and patient advocates to work around obstacles to access and have a bigger say in their own care. One of the audience members, William Decker from Baylor College of Medicine, says that in Texas a law was recently crafted saying that as long as a potential therapy had gone through a Phase 1 safety trial it should be offered to the public and the public should be able to pay for it. Decker and his colleagues argued before the Texas Legislature that potential therapies should at least have to go through a Phase 2 trial to make sure they were not only safe but also showed some benefit for patients. In the end Texas lawmakers rejected the Phase 2 idea but did say patients could not be charged for the therapy, and there could be no compensation from insurers or anyone else for the manufacturer of the therapy. He says removing the financial benefits and incentives pretty much ensured that no company would offer patients a therapy under this law. The panel agreed that in most cases these laws don’t give patients any rights they don’t already have, but do give the appearance of making access easier. They said it’s feel-good legislation, allowing people to feel they are doing something without actually doing anything.